1940s original designed palm tree wallpaper. 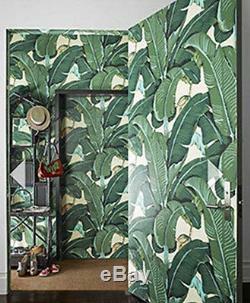 This distinctive design, with its large, bright green leaves, and waving banana palm leaves, is probably one of the most recognizable vintage designed wallpapers in the world. Try it in a bathroom (don't forget to paper the ceiling) for a touch of jewel box glamour or the look is fabulous in a living, dining or bedroom. Length approximately 15 feet long. Super fun, kitschy retro modern, authentic wallpaper. Perfect for the mid century, modern, avant garde, hollywood regency, sixties, forties, art deco, fifties, 40s 50's 60's home. Recent print of original design. Key words: green palm trees key west florida beverly hills beach cozy comfortable fun kitschy laid back bungalow 1960s retro modern danish mid century martinique fabulous. We try hard to keep up to date with our listing stock availability. However, our items are popular and sometimes sell quickly. We are here to help! If you need assistance with selections or anything else let us know. 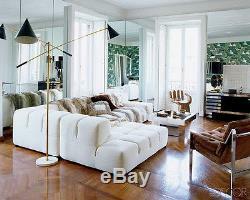 We are mid century design specialists and have additional stock available. The item "Vintage Designed Key West Palms Wallpaper Mid Century" is in sale since Thursday, June 26, 2014. This item is in the category "Home & Garden\Home Improvement\Building & Hardware\Wallpaper & Accessories\Wallpaper Rolls & Sheets". The seller is "daisiesintheattic" and is located in Woodland Hills, California.